Why would you buy the Sylvania Silverstar Ultra? For that matter, why would you buy any halogen light? 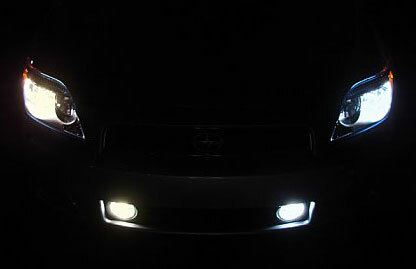 Aren’t HIDs better? Aren’t LEDs better? Well yes, but also no. Regardless of all the improvements in the world of HID and LED technology, manufacturers persist in installing halogen lights in the majority of their cars. And why wouldn’t they? They’re far cheaper, and are adequate for the job. It also allows salesmen to charge for pricey extras when you buy a new car. One can purchase an aftermarket kit to replace your halogen setup with that of a HIDs or LEDs. But from a legal perspective this is usually frowned against. And regardless of how easy it’s made, you’ve got the hassle of extra wires, ballasts and compatibility issues. You’ll also find some people either don’t know about alternatives or just couldn’t be bothered. Thus we are left with a huge market for replacement halogen light bulbs. For reference, all the prices I’ve quoted in this article are for the 9006 form factor, and purchased direct from the manufacturer. This gives a fair comparison between the various products. It’s difficult to determine exactly how Sylvania support all their claims for more clarity and Ultra Night Vision. It’s important to note that all of these claims are when compared to their Basic brand. I guess it’s easy to make each model slightly better than the last, and thus create a model range. Sylvania’s goal with the SilverStar Ultra is to ensure driver comfort. They achieve this by ensuring a whiter light with the brightest down-road performance and illuminating more side-road. The white light improves the contrast of objects you encounter, making it easier to distinguish items on the side of the road. If the driver can see better, he will be more comfortable. Linked to this is safety, and Sylvania have a series of ads focusing on the safety benefits of having effective lighting. They achieve the whiter light lamp by applying a special coating to their products. Additionally, Sylvania use their own design of filament and a propriety gas mixture to get the brighter down-road light. The whiter light is rated at 4100K, which will still have a yellow tinge to it, but much further up the scale than a normal halogen bulb (around 3000K). Everyone seems to agree that the SilverStar Ultras are much brighter than stock fitted light bulbs. The whiter light and better pattern help make everything more visible at night. Depending on the car people have installed the Sylvanias in, they offer different opinions on exactly how much brighter they are. Ignoring this, extended line of sight, and wider viewing angles are the norm. The biggest complaint that people seem to have about this product is its lifespan. It’s actually the only complaint people have. The problem is not unique to Sylvania though, and I speak more about it later on in the review. However, Sylvania offer a 1-year warranty on the SilverStar Ultras, and people receive replacement parts when raising problems with Sylvania. As with most off the shelf halogen products, the SilverStar Ultras are simply packaged in a cardboard backed plastic casing. Nothing fancy, but all you need for a pair of lightbulbs. The parts themselves are of a quality one would expect from Sylvania, with good plastics and solid feeling assemblies. Unlike replacement HID or LED kits, you don’t have any extra electronics or wires. The bulbs plug in with ease, just like the bulbs you’re removing. In the same manner as when installing HID bulbs, it is recommended that you wear gloves when installing these halogens. If you don’t have gloves handy, make sure you don’t touch the glass of the bulb. Touching the bulb can leave oil deposits on the bulbs, which could lead to early failure. The lightbulbs come in a variety of sizes, one to match every size required by your car. They also have dual hi/lo beam lights. These have both filaments encased in the same glass housing and sport 45W/65W or 55W/65W power ratings. This is in contrast to the singles 55W (9006) or 65W power rating of the single bulb products. The different sizes and forms all have slightly different price points due to the extra casings that certain forms require. If you’re ever unsure of what bulb to use, you can try out Amazon’s built-in product identifier system. You can also visit one of Sylvania’s product pages on Amazon, and go to their ‘user guide’. It’s a 318-page pdf which lists almost every car ever made. In recent history in any case. But for each car it’s got a list of the light-bulb type for each application. The product pages for Amazon are also very good at showing several images of the bulb in question from different angles. It’s easy enough to remove a light bulb from your car and compare it directly to the photos. If you’re in the US you should know Sylvania. If you’re from Europe you may not, but then you will recognize Osram. You know Osram, the company that makes basically every light ever? The same one that is pretty much the industry leader in all things lighting. Well Osram own Sylvania, and have for over 20 years. Sylvania is the name by which they sell their products in the US. And it’s not just automotive lighting they do. Osram Sylvania (as the company is actually referred to in the US) sell light bulbs and related equipment for all industries from your home to the hospital. Despite this diversity, within automotive lighting Sylvania have not been left behind. Although halogen lights are still a large portion of their business, they do sell a range of HID and LED lights. These are mainly sold as OEM (Original Equipment Manufacturer, this means they supply people like car manufacturers) replacement parts. One of the big advantages with buying products from a company like Sylvania is that you don’t have to worry about compliance. You can know for sure that using any lightbulbs they produce will meet the required SAE and DOT requirements for lighting. Notice the slight blue-ish tint to the glass. This is how the white color of the light is achieved. The downside to this is that whenever there is any tint to the glass, you loose light output. So, to compensate, and to fulfill the claims of higher light output than stock, these bulbs, along with all premium halogen replacement bulbs claiming higher light output, run hotter, and more intensely. The result? A white, bright headlight bulb that only last about one year. If you don’t mind that, like me, then these are great. Sylvania is a trusted brand, with a good reputation. So if you’re looking at several high-end bulbs, you might as well give them a try. 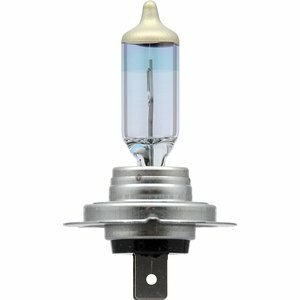 I’ve personally tested several high end bulbs in my vehicles over the years, and these have been some of my favorites. If you’re looking for that HID look, you won’t find it in any halogen bulb. If you want the look of HIDs, get HIDs. If you want a bright, white, and legal halogen replacement bulb, this is a great bulb to have. You likely won’t be disappointed, speaking from experience. I’m currently experimenting with some other brands, for variety’s sake, but I would buy these again. Sylvania sell 5 different products in the halogen headlight space. They have the normal Basic (that’s its product name) bulb, which is your run of the mill halogen light. Most people will buy this when they’re just wanting to replace a blown bulb, and not interested in paying for anything extra. It costs $10 for a two pack, and that’s that. Next up you get the Sylvania X-traVision. This takes you to $20 for a two pack. It still has 55W bulbs, but these are optimized for increased down road visibility. This allows you to see further down the road than the Basic bulb. If that’s not enough for you, you can opt to pay $27 for the Sylvania SilverStar 2-pack. Again 55W bulbs, this time they have the same increased down road visibility, while also providing more clarity. This clarity comes from a whiter light. 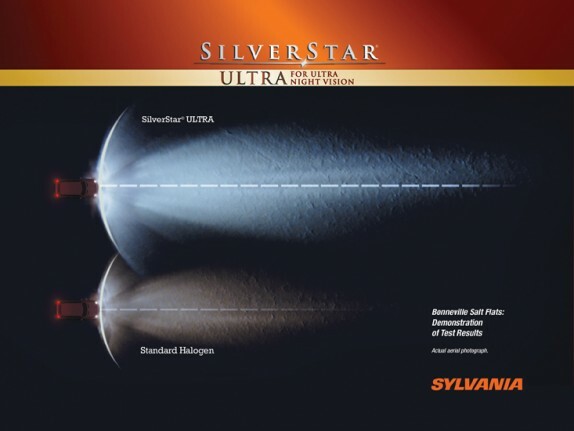 Finally, you get to the Sylvania SilverStar Ultra High Performance bulb, priced at $34 for a 55W two pack. These offer all of the above and specify they are for Ultra Night Vision. Sylvania also offer the SilverStar Ultra in a zXe model. This one is very similar to the non-zXe, but uses xenon halogen gas to give the lights an HID look. It costs an additional $6 for two bulbs. Ignoring it for now, we refocus on the SilverStar Ultra. Sylvania even go through the effort of comparing all their products in the above image. It allows you to clearly see the improvement each model offers. The next lighting manufacturer you probably know (and arguably Sylvania’s main rival), is Philips. Much like Sylvania, Philips have a range of halogen lights. Their comparable specifications are a bit more objective than Sylvania’s, giving quantitative values to the difference in distance that can be seen. The quantity is a percentage value relative to their other bulbs. This still makes it difficult to compare products between manufacturers. They then assign the bulb a performance rating, ranging from 3 to 5 stars. At the top of their range is the Phillips X-tremeVision with an evenly priced $34. It has 3.8 stars on Amazon and has similar claims to the Sylvania SilverStar Ultra with regards to being able to see farther and better. It has a matching 55W power output. Philips are also an OEM for halogen lights, which ensures the lights are street legal. For the American market, you can also look out for the General Electric (GE) Nighthawk Platinum. At $36, it’s marginally more expensive than the Sylvanias. GE also have a range of products, including a standard, long life and several Nighthawk versions. The Platinum is their top of the range. Their parts are also DOT compliant. They’re Oddly rated at just 45W, but no complaints about the brightness. There are claims by different users of the Sylvania SilverStar Ultra bulbs lasting in excess of 3-years. Officially termed long-lasting bulbs are available, but they aren’t as bright. In the grand scheme of things, I’d recommend forking out an extra $30 every 2 years to ensure you have the brightest lighting you can. Many people claim that the various brands’ high performance lights are able to be as bright and effective as they are, by submitting the components to physical conditions beyond what they should experience. This results in a decrease in lifespan of the product. Sylvania, GE and Philips’s product data all support this statement, showing a lower lifespan for their high performance products than their entry products. Philips claim over 300 hours on their top product, compared to only 200 hours with the Sylvanias. As mentioned all of Sylvania’s products come with a 1-year warranty. If you’re getting two years out of a set, you should be happy. Anything more than this and you can count yourself lucky. Across the board, the only complaint anyone has of performance light bulbs is their lack of longevity. All 1 and 2 star ratings on these products relate to early failure, generally within the first 6 months, and I agree with those ratings. If we use the number of 1 and 2 star ratings as an indicator of the bulbs’ failure rate, some interesting points are revealed. Note that more people will complain about a product than praise it, but if we assume a similar rate of complaint for all products, we can compare one to the other. The Sylvania SilverStar Ultra has a failure rate of 23%. This is better than GE’s product which comes to 26%. However, the Philips product comes out tops with only 20% failure. 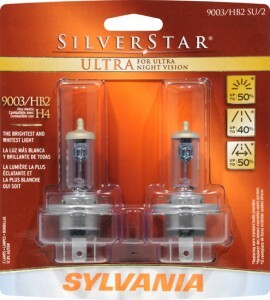 The Sylvania SilverStar Ultra is Amazon’s second bestselling headlight bulb and for good reason. It is a great product, backed by a solid manufacturer. It delivers on its promises of being a bright bulb. This is both within its own product range as well as relative to stock bulbs. If you’re contemplating a product from within Sylvania’s range, get the SilverStar Ultras. But know ahead of time that they’re not going to last several years. If you wanted to know the number one bestseller on Amazon, it’s the Philips product. And at the same price as the Sylvania SilverStar, it would probably be my recommendation. It not only has a slightly better review score than the Sylvania’s, but the manufacturer claimed lifetime of the product is also 30% greater. As I mentioned, the Sylvania SilverStar is good product, so if you can pick it up at a lower price than the Philips product, then go for that instead. If the price of these products is really too much for you, buy the product that fits your budget. Remember the cheaper products aren’t as bright, but they do have longer predicted lifetimes. As with any replacement, and as part of normal maintenance, do yourself (and your fellow road-users) a favor and make sure to level your headlights. Search your cars manual, or look online, for instructions on the best way to do this.